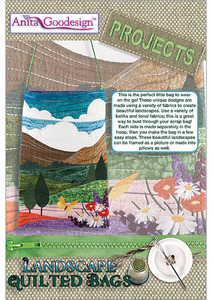 Landscape Quilted Bags/Projects Collection/ 13 bag Designs in 3 sizes each. This is the perfect little bag to wear on the go! These unique designs are made using a variety of fabrics to create beautiful landscapes. Use a variety of batiks and tonal fabrics; this is a great way to bust through your scrap bag! Each side is made separately in the hoop; then you make the bag in a few easy steps. These beautiful landscapes can be framed as a picture or made into pillows as well. Designs in 3 sizes each for the 6"x 10", 7"x11" and 8"x12" hoops.